On Monday, June 5, 2017 at approximately 3:31 p.m. an attempted homicide occurred in People’s Park. The female suspect approached a 2-year old male who was at the park’s play structure with his nanny. The suspect walked up to the 2-year old and placed something in his mouth. She immediately checked the boy's mouth and found nothing in it. The nanny called UCPD to report the incident. Officers and paramedics responded and the suspect was taken into custody for a psychiatric evaluation. While in route to the holding facility the suspect told the paramedics that she had given the child methamphetamines. The toddler was taken to a local hospital where it was determined that the suspect had given the child methamphetamine. The child is recovering in a local hospital. The suspect has been arrested for attempted homicide. 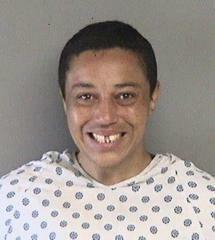 THOMAS, Sayyadina, a Black female, 36 years of age, 5’5” in height, 215 lbs., with black hair and brown eyes. is someone whom you know.